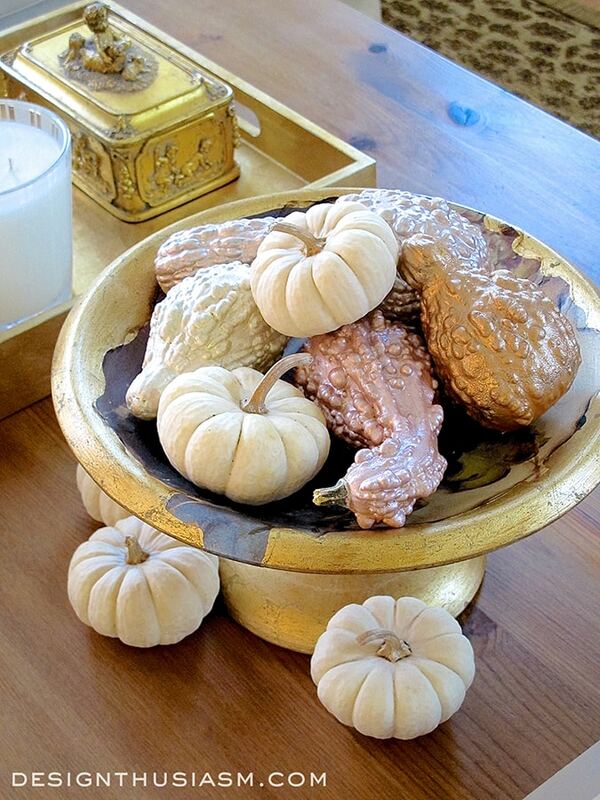 When it comes to seasonal decor, I just love the fall. 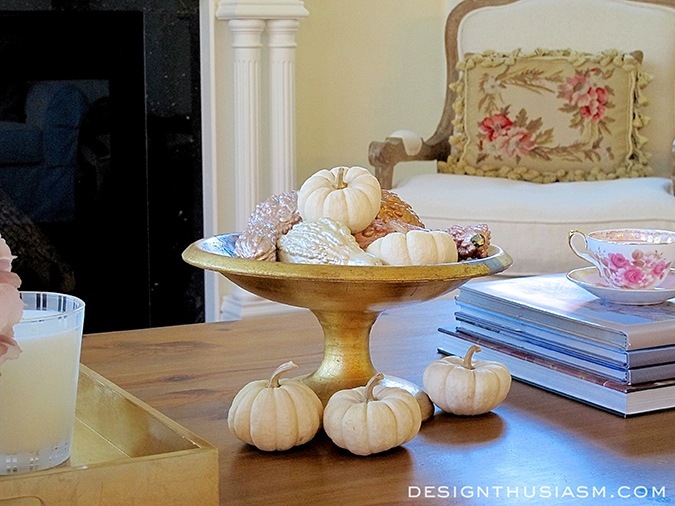 The rich spicy aroma of fall potpourri, the lovely visual cues of autumn imagery, the suggestion of homey comforts for the coming cold weather, it really sums up everything I love about home decor. But the one thing that’s a challenge when it comes to fall decorating is working with colors that don’t fit with my typically soft palette. 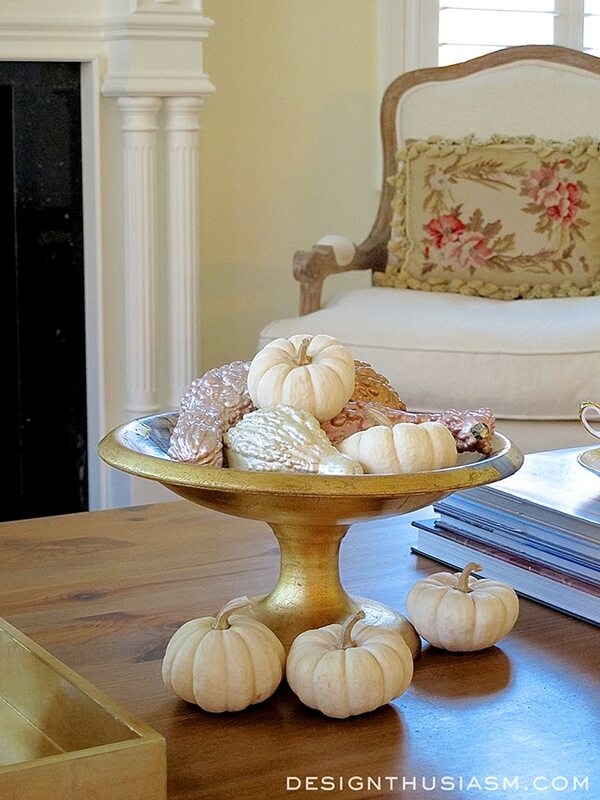 To solve this dilemma I came up with a solution that I return to year after year, here utilized in an easy, budget-friendly fall DIY centerpiece. This really is the simplest of projects and can be completed quickly in an afternoon. I’ve been known to enjoy decorating with food, so I started with a trip to the grocery store to buy the most interesting gourds in varied sizes and shapes. 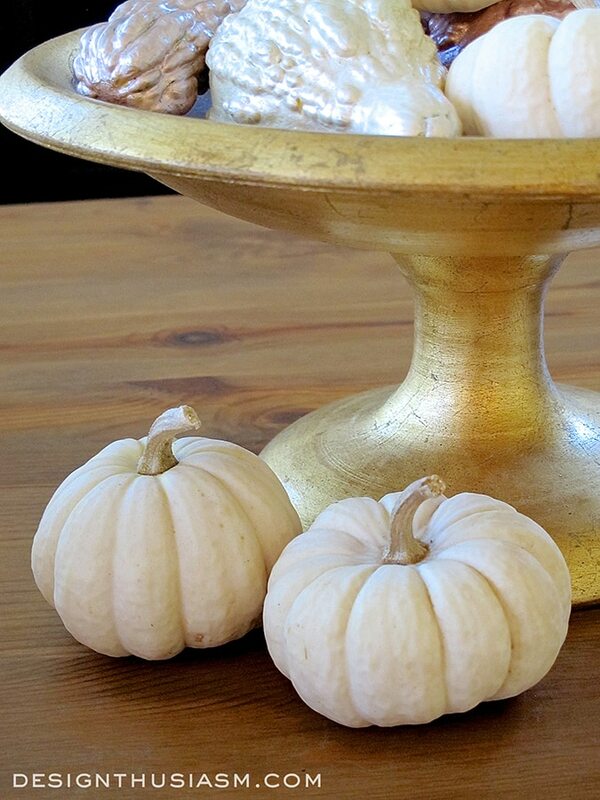 I like to add in some mini white pumpkins for their soft creamy tones and their unmistakable message that Thanksgiving is near. The most essential part of making this arrangement a success is assessing the colors in your home and the hues of the season and then marrying those palettes in a harmonious blend. My den is centered around creamy whites and pale yellow with blushy rose and gold accents, so there was no way it would sit well with the traditional rusts and browns so common in the fall. A trip to Michael’s is all that was required. I love Martha Stewart’s metallic paints and the sheen of the pearlized colors also works well. I tend to just buy two or three colors and then mix them together to come up with more diverse options. I use the cheapest brushes for projects like this (even though I’m an art school graduate with a history of painting with the finest sable brushes). Here I bought the economy pack, disposable if necessary and I could cover a lot of ground the the bigger sizes! 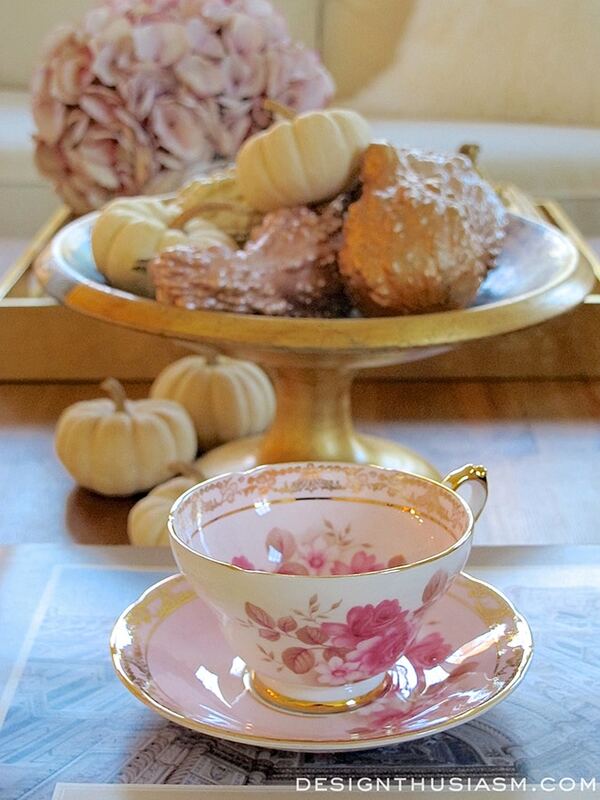 My plan was to use a shimmery copper to bridge the soft tones of my home with more seasonal hints. I added pink and rust to the gold to achieve a metallic copper and used pearlized white alone and then tinged with pink for a blush tone. I love the way the light hits the glimmer in the paints and for me, that character is what makes the pieces work together. I don’t think the effect would be as muted with flat paints. 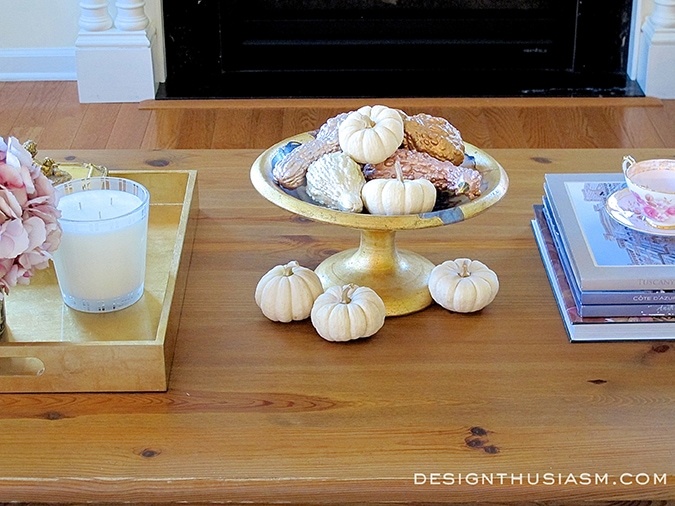 This is an easy way for me to make fall decor work with my home. I tend to dive right in when I work on something like this, often painting right on my granite counters or grabbing the nearest mailer catalog as an underpinning to protect my work surface. I used two coats on these gourds because they are light in color, but I was mixing paint as I went and barely waiting for them to dry to complete the next coat. When I say it’s a fast project, I mean *really fast*. I think seasonal decor works best when it fuses right in with your existing decor and only hints at the season, without being ‘bang ’em over the head obvious’. I save that sort of more overt thematic thing for my tablescapes, when I only have to live with it for one night. 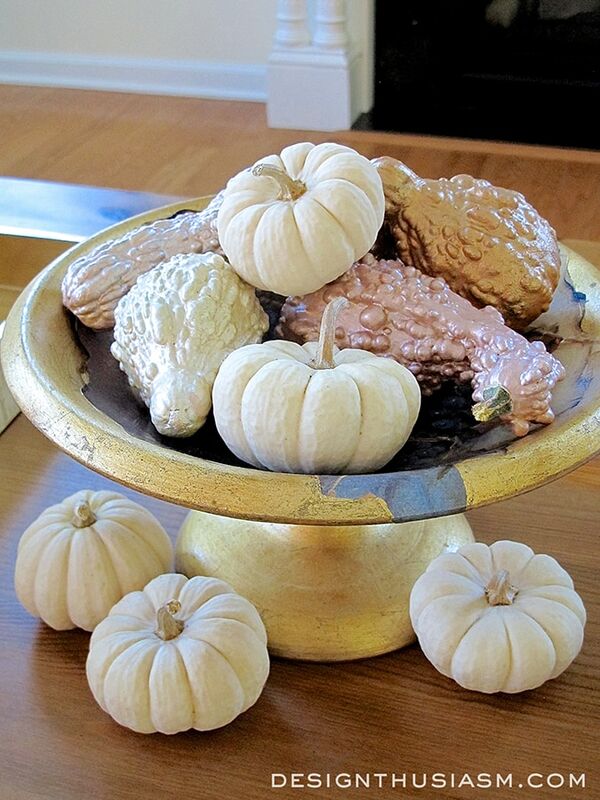 I’ve painted gourds in the past when I wanted to manipulate a more unusual color palette, which can be seen in this post of a Thanksgiving table. The only thing stopping me from keeping this centerpiece out for months and months is that they are actually real gourds that will eventually spoil. But for now I’m happy with my shimmery ode to fall. Linking with BNOTP, Dwellings Amaze me Monday, A Stroll Thru Life Tuesday, The Scoop, Savvy Southern Style Wednesdays, Pocket of Posies, Jan Olson Thursday, The Vintage Nest Share Your Style, From My Front Porch to Yours, The Creative Exchange, Feathered Nest Friday, Romantic Home Friday, Shabby Nest Frugal Friday, One More Time Events, Crafts a la Mode Weekends, Sundays at Home, Motivation Monday, The Inspiration Board, Think and Make Thursday, Inspiration Monday. Hello Lory, I had the wonderful opportunity to meet Amy from Ms. Toody Goo Shoes and as we were chatting over lunch she mentioned your blog. I have become a follower and I must tell you I adore your style and talent. This is such a pretty vignette. I use the softer side of all colors too. It works with my décor. The harsh oranges don’t bring the look to our home that I want to achieve. Cindy, thank you so much for your kind words and welcome to the blog! How fun to know Designthusiasm was spoken about over lunch… 🙂 I so appreciate your feedback because it’s so nice to know my style resonates with others. Thanks again for visiting and taking the time to comment!! 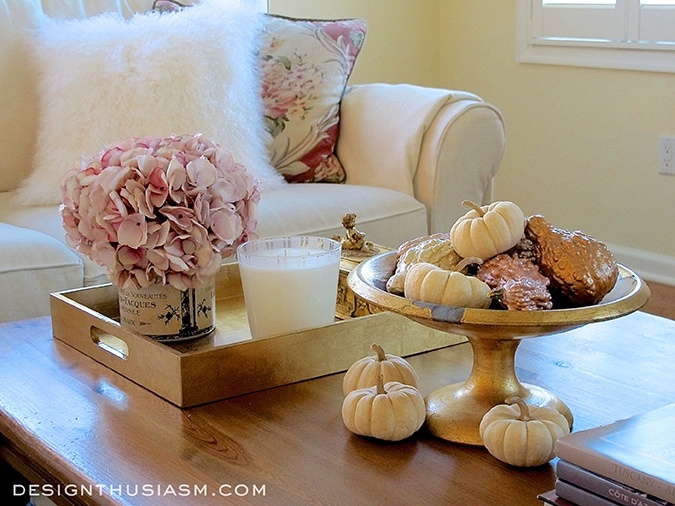 I love your fall decore I am not a fan of the bright colors either. I like the softness of the pastels. Looks lovely! Thanks, Ellie! I can do the richer colors in a ‘one shot only’ tablescape, but to live with for a few months, I’m all about the softer palette… 🙂 Thanks for stopping by! That’s beautiful, Lory. I like that it is simple yet elegant. The color palette is absolutely luscious Lory! Very elegant and fits perfectly into your home. Thanks for sharing with SYC. So pretty! Love the shimmer of the paint. 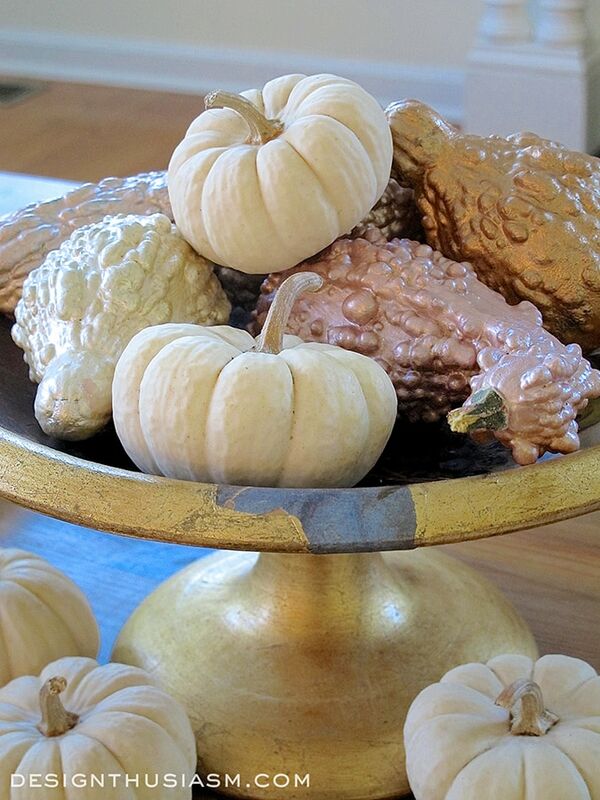 Hi Lori – I was reading your blog today which linked to your last years fall inspiration post (that I missed seeing somehow) and I just LOVE the painted gourds idea. 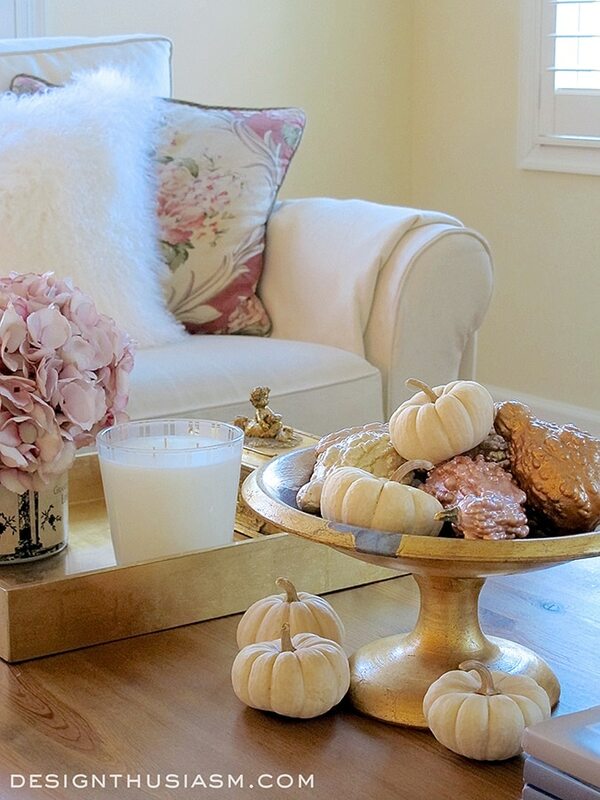 Like you, I do not prefer the typical fall colors and lean towards the softer side with white and the blueish green pumpkins with silvery foliage. BUT…last year I bought gourds because of their shapes and let them dry so painting them is just the ticket to bring them into this years fall decoration… even if I am a year behind you! LOL. Thanks so much for the inspiration! Love your blog! Thanks, Debbie!! So glad you got inspiration from that post… 🙂 Yes, sometimes even I forget about my older posts and seeing them again reminds me of some ideas to revisit. When in doubt, paint it the colors you need… lol!! 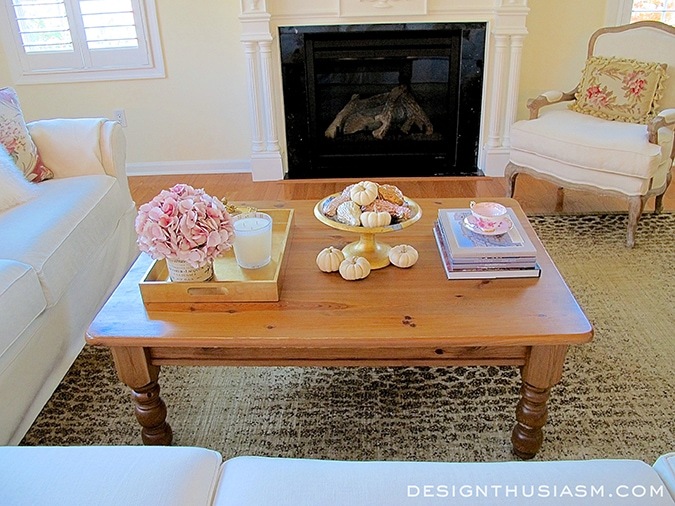 those lighter shades are fab, but isn’t it really difficult to clean and maintain them? I always find that to be an interesting question. Here’s my take on that. Wouldn’t you rather be able to see the dirt so you can properly clean it than to know your things are hiding dirt that you haven’t cleaned? 🙂 I actually thing light things are no harder to clean than dark ones.